Many tourist come to VietNam to visit Ha Long Bay and quicky find out Cat Ba island is worth staying longer for , with it is quiet villages and many attractions.Cat Ba Package Tour will ensure you see the best of Cat Ba island, Lan Ha Bay and Ha Long Bay for a great price and take home memories that will last a life time . The tours will departure from hotel at 8.00 am to Cat Island. You will take a boat cruising around Lan Ha Bay. On the boat, you will pass through the floating fishing villages around Lan Ha Bay and enjoys visiting hundreds of limestone islands, keep cruising to Halong bay to sightseeing the most beautiful landscapes at less touristy areas. 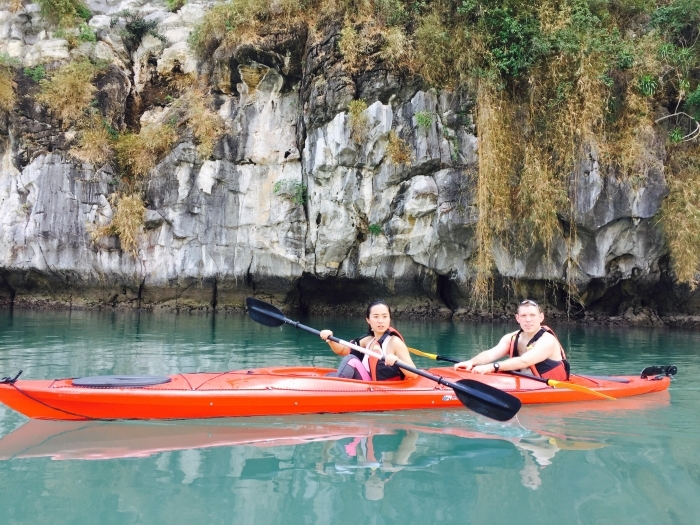 After visiting, it is time for adventurous and self-discovery activities, you will take kayaking through the rock arches to hidden lagoons and tunnels to discover the Bat Cave and Dark Cave. + Get on the speed boat or ferry (depend on your choice) and pass to Gia Luan harbor. + Private car take you to Ben Beo harbor, start to discovery LanHa bay. + Go kayaking around islets and Dark & light cave.